Gross stuff: I walked into the staff toilet at a gig tonight to find an old lady having a pee with the assistance of her carer. Why oh why could they not lock the door? Brownie stuff: I missed the meeting tonight - but know they're doing some Thinking Day things and some pancake day things. I had an email today from the local woodland group - award winners, don't you know? They have said that we can help plant some trees and they'll give us a talk/guided tour of the woods. COOL! Also - the community policeman is coming in to see the girls. Work stuff: I have reports to do. Again. I have 3 different teaching jobs, all of which require reports at different times of the term. It's lucky that report-writing is my all time favourite passtime really. Knitting stuff: Baby blanket getting there. 4 squares and a border to go. Fun stuff: Our friend has booked us all a holiday in a cabin in the highlands. We've been to the aquarium near Loch Lomond - it was rubbish. We've also been for a walk in Lochwinnoch where two very friendly mink came out to say hello. One black, one grey. Oooo - we also went to the seaside in North Berwick. VERY beautiful but I haven't got round to uploading the pictures yet. I have lost a pupil's phone number. 2 weeks ago he had a lesson. I forgot that in 2 weeks time I would have a gig so not be able to teach him. 1 week ago he missed his lesson due to school holidays.... Now I don't know how to let him know and I'm not sure how to fix the situation. The current plan is to sweet talk his school into passing on a message but I know it's a bit weird and I'm not sure they'll go for it. I had considered lurking round the school gates but I think that's weirder!!! Update: I found cover for my show - so I can do my teaching. That solves it and reduces my guilty feelings. I did discover though that I forgot to turn up for Thinking Day today despite inviting my Brownies. Nobody phoned me... A parent texted to apologise for forgetting. At that point I realised what I'd done and since then I've been sweating a bit. I'm SURE that there were enough Guiders there, but I'm sorry I missed it as I've been every year and should not have forgotten. I forgot that my friend (for whom I made the hat) was a Rangers fan. This means it is against the laws of nature for her to wear green. Did you spot the last post? 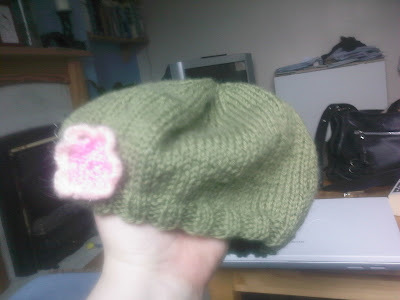 I made her the greenest of green hats. 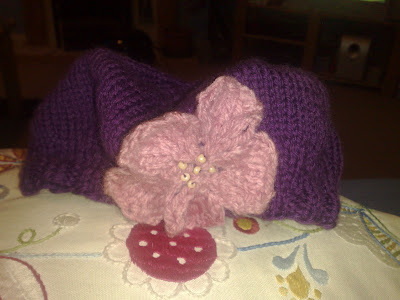 She was very excited to get a hat and it looked very cute on her but I made her give it back so I could do another one, as I know whilst she'd wear it for a while, she'd stop wearing it because of the colour. I'd rather give it to someone who'd genuinely love it. 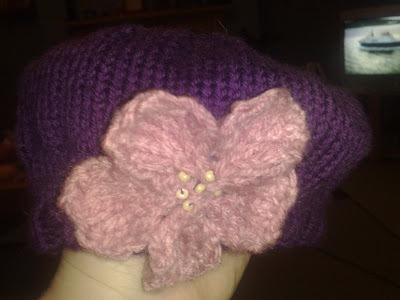 This is the new hat - I think it's pretty. Well it's Valentines this weekendand my boyfriend is working so I'm on my own again. I don't feel like getting in touch with friends to see what they're up to, as I'm quite happy doing my own thing today. 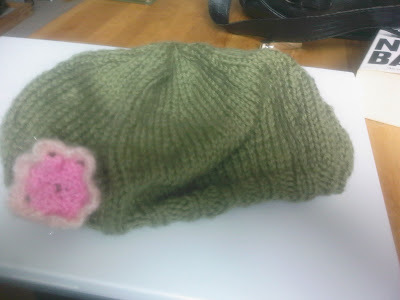 I have knitted half a beret. I have someone in mind for it and will put up a picture if it turns out nice! I am still knitting a baby blanket for a friend, though I have made a mistake in it. The idea of fixing it is daunting. I think I might ignore it. I have another few weeks to finish this. Brownies is off this week as it's half term. The following week I have to miss it for work. I have reports and invoices to do for school, but it's Valentines Weekend. That's got to be a good reason not to, right? Yesterday I was bored and started thinking about things that brought me down. It wasn't a good day. Each year on 14th Feb my boyfriend and I take turns making something special for each other. Last year he made me a chinese meal - most impressive! This year I struggled for inspiration. Due to a variety of things - car problems, cat illness, wedding - it's a lean month in the Champ household and I'm cooking on a budget. Whilst I enjoy cooking and usually relish the challenge of making something from nothing, on Valentines night I'd rather have been able to choose the meal I think he'd like the most from a new recipe. There was nothing for it anyway, so I did my best. Chinese style pork starter (chinese style pork was reduced to £1 in the supermarket) - delicious actually. There was going to be salad but that was slimy and smelly when I opened up the bag, despite buying it on the day. Irritatingly, I had a question on the payment machine at the till 'Did our vegetables seem fresh today'... I had ticked YES. Main Course Ham hock slow-cooked casserole. I used some spices, stock, carrots, onions, leek, swede, new potatoes and a ham hock and slow cooked it over the whole day. At the end I squeezed in a lemon and added some sweetcorn. To accompany the stew I had a couple of sesame seed rolls. Pudding - not required. I had planned to make crumble but we wouldn't have eaten it after all the food we'd already had so I'm glad I didn't waste the effort. He gave it a 10/10 and said it was the nicest stew I've made. That's good. I'm pleased he went back for seconds later in the evening, as it must have been true. The sweetcorn was the real winner as it's his favourite vegetable. My valentines gift (which we don't do usually) was a bar of dark chocolate from his work. His valentines gift was... nothing. I hope you are having a fine weekend! I started this blog around when I became self employed, so was going through big changes in my life. My brother had a blog and inspired me to try it out for myself. I loved it. I loved the easiness with which I could record what was going on, and I loved the interaction with people from all round the world. Recently this has been replaced by a desire NOT to tell people things I would like to record. I can't put them here unless I'm happy for everyone to see them - and clearly I'm not. After receiving an email a month or so ago in which things I have put on my blog have been taken out of context and used to form negative opinions of me and my life, I've been toying with the idea of sacking this blog and starting again somewhere else anonymously. The option to stop blogging altogether has occurred to me and is also tempting. For now, I'll just leave things as they are, as quick catch ups and Brownie records. In time perhaps I'll record some of the things that I find more personal too. Dixie has bladder stones - he's going to be ok although he'll be on a diet of special vet food forever now. He had two injections and has pills and capsules, plus wet and dry food designed for old cats with bladder problems. Last night we had our Brownie Friendship Pledge Party. The girls had to pair up with someone they didn't know that well, then they decorated a star shaped biscuit using items their friend particularly liked - colour of type of sweetie. I iced one for our Young Leader who said that she likes yellow especially in her decorations... weirdo! Yellow smarties and jelly tots for her then. I bought cakes (making biscuits was enough work) then gave them Love Hearts to use, as it's valentines day this week, to decorate a cake for themselves. I had planned to let them eat the cakes later but they didn't want to in the end when I said they'd have time for another game if they took them home. We cleared up then played games: Unlucky 13 (so they could go out in pairs to wash their hands while the rest of us got on with something else), the Friends Game suggested by a Brownie (Two go outside with a leader and have to learn as much about each other as possible. Meanwhile the girls inside think up five questions for them to answer - trying to catch them out), then In and Out the Dusty Bluebells. Is it dusty or dusky? I don't suppose it matters. That was about all we had time for after six points*, letters, goodie bags (chocolate heart and a heart shaped hairclip) and Brownie Bells. *Brownies can earn points for their Six group - at the end of term they win a prize for the most points. Today we have had a lot of snow. I have a cat called Dixie. We have a cat flap. Dixie does not have a litter tray as he has a garden outside. Dixie does not like snow. Today I realised how much. Having dozed around on the sofa all morning I saw Dixie get up and jump into my magazine rack. It made me chuckle until I had to dive across the room to drag him out as it was VERY clear he was about to use it as a toilet. The cheek of the old man! I took him outside. He likes to go outside when he has my boyfriend or me with him. I had to clear the steps anyway as I am nervous that someone could hurt themselves. Sure enough - off he went to do his business before scuttling back inside to sleep again. UPDATE 12am: The cat is ill. It wasn't the snow. He is peeing a LOT and there is blood in it. In the morning I'll take him to the vet. He's asleep now and seems happy enough. I have tried to get out of work - as it wouldn't have been possible to get from one teaching place to the next in 15 mins without a car............ to find that I wasn't meant to be teaching anyway. Nice! I have skived a bit at Brownies as I was on my own. Told the kids that we were going to 'practise' games that we're going to do at their Pledge Party next week. They looked at me as if I was stupid and one put her hand up to tell me that she didn't think they needed to PRACTISE games as they're pretty good at them already. Not so daft, these kids! We also did some anti-bullying stuff and some relaxation exercises that made them giggle a LOT. Guider: When you're playing head to head do they have to run around in between instructions? Wasn't sure about that bit. Sadly the snow here had cleared, so I had no excuse to miss school. Happily, my boyfriend was off work so came with me to Edinburgh. He dropped me at school, then drove off to do his own thing. I called him to say if he wasn't too far away he should come back as 2 of my pupils were off today........ he replied that he'd broken down 20 miles away. Aagh. The clutch had gone. He was left to struggle to get home. I was faced with the problem of how to get to my 2nd school, then home, then to Brownies. Around this time I received a text saying my assistant brownie leader isn't well so won't be there tonight. 4 buses and 2 trains later I am home. Tired. But we're on the guest list at King Tut's tonight so that's cool! Not a lot - just a little. However London it seems is laden with it! The East Coast has been hit worse than the West I hear - so I have to check the weather forecasts etc for school tomorrow. The perils of 50 mile commute. Tax return is done, finished, submitted. PHEW! Wedding - organised and only a week away. Teaching - stuff ordered that needed to be ordered. Think I'm organised now. Brownies - this job wasn't top priority so it's still on the list really. I need to write/email a load of places the kids suggested we try/visit/see to find out whether they'll have us. Then work out how we fit them into the rest of the year. It'll be fun but I really haven't had time yet. Household - it's a tip. So I'm on my way. Just have to do the house and Brownies. It'll be cool. 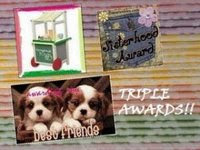 Tawny gave me an award last week for which I am most grateful! It really cheered me up when I was getting a bit swamped. 3. Be sure to link to your nominees within your post. PPPLLLLEEEEEASE just help yourselves! !